The Key Line Pi availability is in stock and shipping immediately. 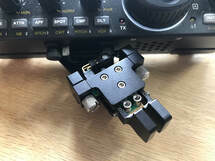 ​The Key Line Pi is a mounting bracket for attaching the KXPD2 or KXPD3 paddles to either the KX2 or KX3. The paddle connects to the 4 pin jack on the radio using a supplied short cable. The bracket is attached to the radios using captive thumbscrews. Why did we call it Key Line Pi? Well, you can change the Line of the Key by changing its angle along a circle, which has something to do with Pi. And it tastes good too.